Fashion is not my thing. Clothes are functional. I don't know if that is a result of growing up on a farm and sometimes being the fifth child to wear the article of clothing (and possibly 10 years after the first person wore it) or if it is just genetics. However, I do know clothes can effect your mood. I don't know when this thought was planted in my head, but I know that I often dressed a little nicer on test days because I thought it would help me do better. It was the psychological aspect that drew me to You Are What You Wear. I liked how the book was divided into sections and there was a questionnaire in the beginning to help you decide what issues you may be facing in the closet. From the list of chapters, I already had an idea of the chapters that would most apply to me. As I read through all of them, I did find times in my life when the description matched me and helped me to understand better what mentally and emotionally I was going through. Much of the advice given is not really new advice, particularly for steps to clean out your closet (pull everything out; sort out items that are worn, torn, stained; then go through those you haven't worn in a while and those that no longer fit). Jennifer, though, provides the why for the advice. I think often when we dress, we do not give a conscious thought to underlying message. For me, bringing attention to the underlying message of what our clothes say is what I really liked about the book. Beyond the message, Jennifer also helps to uncover the reasons we may be engaging in that behavior. The book goes past just diagnosing the problem, but provides tips and steps of action you can take to remedy the issue. She also takes the issues from our clothes and helps you identify other aspects of your life that are being affected. As any responsible medical professional should, she also delineates when a behavior may require professional help. 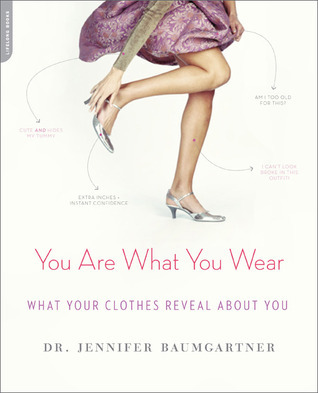 If your closet is disorganized, you feel you have nothing to wear, or others have made negative comments about your wardrobe, but you don't know where to start in fixing it, then you should pick up a copy of You Are What You Wear. This is my 200th post! Thank you for reading. I would love to hear about your fashion woes or your favorite outfit. Do you have something you always wear when you are feeling sad or when you want to celebrate? This sounds like an interesting read. I tend to wear bright pink (fuchsia is my favorite color) or red when I need a lift. My toes are painted Fuchsia! I'm only throwing digital confetti this time. I think there is still confetti in my keyboard from my 100th post. Very interesting! I think I need that book. I love clothes and shoes, although I don't spend a lot of money on them---I always look for sales.